The Cooper Tires USF2000 National Championship Powered by Mazda held it’s first triple-header weekend this past Friday and Saturday at the historic Road America circuit in Elkhart Lake, WI. The started out without surprise as the Cape Motorsports trio of Spencer Pigot, Trent Hindman, and Matthew Brabham, continued their dominance of the field during free practice. When it came time to qualify, however, Belardi Auto Racing’s Scott Anderson showed that his pace at Mid-Ohio was no fluke and took the pole in a rain-shortened qualifying session. Pigot and Brabham would start right behind Anderson in P2 and P3. Anderson’s first series win two weeks ago in Mid-Ohio came during sketchy conditions on an initially wet track that was rapidly drying, and his pole-setting time this past weekend It remained to be seen whether he would have the pace to keep up with the two lightning fast drivers from Cape Motorsport. When the green flag dropped on Race #1, both Pigot and Brabham quickly made their way around Anderson and it look as though it was going to be business as usual with Pigot in P1 and Brabham in P2. A multi-car incident would bunch the field back together after the first lap and Brabham got a better start than Pigot taking the lead. Pigot, attempting to fend off Anderson, was called for blocking and then violated the pit speed limit. His drive-through penalty for blocking was served on the last lap of the race and therefore his speeding penalty was assessed as a time penalty post-race dropping him back to P16. That’s a serious blow to Pigot’s championship aspirations as Brabham would continue on to take the victory. Anderson was embroiled in a battle with privateer Matthew Di Leo for most of the race until he was finally overtaken on the last lap. Although he lost the position to Di Leo, Pigot’s compound penalties would assure Anderson of his second straight podium with a P3 finish. Di Leo’s P2 finish ties his best finish in the series and reinforced his hunger for the top spot! Race #2 of the weekend was far less eventful with the front-runners circulating without incident or position changes. Matthew Brabham ran away from the rest of the field, scoring his second win of the weekend and reclaiming the championship lead, something he’s not had since leaving Sebring at the beginning of the season. Scott Anderson maintained his P2 spot and scored a third consecutive podium. Spencer Pigot had a much better result in Race #2 than he did in Race #1, finishing on the podium in P3, but the damage was done and his championship lead was relinquished to Brabham. Race #3 saw Scott Anderson back on pole after setting the fastest lap and a new track record in Race #2. He kept that lead position for all but one lap as he battled with Brabham and Pigot. 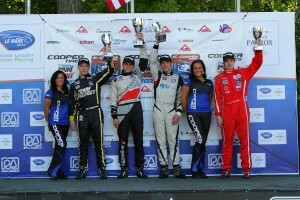 He regained his lead position and went on to win his second USF2000 race. Anderson’s great run of podiums these past two race weekends has seen him close the gap to the two Cape Motorsports hotshoes, but it might be too little, too late. Brabham now leads Pigot 248 points to 234, but Anderson, although solidly in third, is still well back with 198 points. With only two more race weekends and four more races to go, Anderson just doesn’t have the time to make a strong run at the championship lead. Stranger things have happened, though. If we see another race or two like Race #2 at Mid-Ohio where Brabs and Pigot both DNF’ed while Anderson took the victory, that 50-point gap could shrink rapidly. Regardless of the outcome, Anderson has shown that he and Belardi Auto Racing are a serious force in USF2000. The series’ next event is on Labor Day weekend with the rest of the Mazda Road to Indy and the IZOD IndyCar Series on the Streets of Baltimore.